DOHA, Qatar, 2018-Jan-16 — /Travel PR News/ — Qatar Airways is delighted to announce that it is the first airline to ever fly the state-of-the-art Airbus A350 to Greece. The airline temporarily upgraded its current triple-daily service to Athens to an ultra-modern A350 on Monday, with the arrival of the flight greeted by a water canon salute at Athens International Airport. Qatar Airways was the global launch customer of the Airbus A350 in January 2015. The award-winning airline has the largest fleet of this aircraft type of any airline in the world and currently operates 22 A350 aircraft across its global network to destinations including Adelaide, Brussels, Geneva, Singapore and Tokyo. It was the first airline to fly the A350 to the United States and to Australia. The airline will also shortly be the launch customer for the state-of-the-art A350-1000. The Airbus A350 aircraft features a total of 283 seats, with 36 Business class seats and 247 in Economy Class. Thanks to the extra-wide cabin design, passengers on board are offered unparalleled comfort in both cabins, with Business Class fully flat beds and spacious seats in Economy Class. With high-definition touch screens and dual-screen function that allows for simultaneous viewing, passengers can enjoy countless entertainment options through the airline’s award winning Oryx One entertainment system, as well as connect to the internet through Wi-Fi service. The award-winning airline in March will launch non-stop flights to Thessaloniki, its second destination in Greece. The four-times weekly new service between Doha and Thessaloniki will be operated by an Airbus A320 aircraft, featuring 12 seats in Business Class and 132 seats in Economy Class. 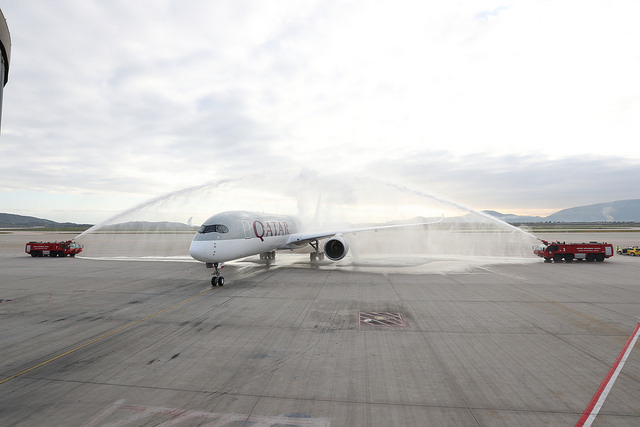 Qatar Airways connects passengers in Greece to more than 150 destinations via its award-winning Hamad International Airport, and also offers seamless connecting flights to its extensive global network of more than 150 destinations across six continents. As part of its continued expansion plans, the airline also recently launched services to Chiang Mai, Thailand and St. Petersburg, Russia, and plans a host of exciting route launches for 2018, including Penang, Malaysia; Canberra, Australia and Cardiff, Wales. The award-winning airline has received a number of accolades recently, including ‘Airline of the Year’ by the prestigious 2017 Skytrax World Airline Awards, held at the Paris Air Show. This is the fourth time that Qatar Airways has been given this global recognition as the World’s Best Airline. In addition to being voted ‘Best Airline’ by travellers from around the world, Qatar’s national carrier also won a raft of other major awards at the ceremony, including ‘Best Airline in the Middle East,’ ‘World’s Best Business Class’ and ‘World’s Best First Class Airline Lounge. This entry was posted in Airlines, Airports, Business, Flights, Travel, Travel Marketing, Travel Services, Travelers and tagged Akbar Al Baker, first airline, fly, Greece, Qatar Airways, ultra-modern Airbus A350. Bookmark the permalink.